Usually if you have a wholesale deal under contract you have to assign it quickly or you may lose the deal. Its important to create a presentation to sell these deals fast and for top dollar. I go over my step by step process and my professional presentation to get my inventory sold so I can move onto the next deal. Hi, this is Josh Weidman. Welcome to today’s REI360 training. Today, I want to talk about how to present a wholesale deal, and the best way to get the most money and sell your properties really fast. So, first question, does presentation really matter? This is really a good question. Maybe you have wholesaled some deals, maybe you haven’t. I’m sure that if you’re involved with real estate at all, you’re probably on somebody’s wholesaler list, they send you out a buyer’s list every time they get another property. And I’ll bet you’ve been in a situation where you’re sitting at your desk and reading the email, the thing pops up, you open it up, and you’re just confused almost with the information as it’s presented. You don’t know what you’re looking at, and I’ll bet you’ve turned down deals or passed over deals just because you didn’t know what was there. I know I’ve been there, and I’ve kicked myself because I’ve seen the email, did something else, didn’t look that promising, and then I found out that a friend of mine or another business associate bought the property, made a ton of money, and, you know, I’m kicking myself. On the wholesaler’s end, if he had done a better job presenting these deals, I probably would have paid a little bit more for the house. I certainly would have picked up the phone and called, and he would have had more options. 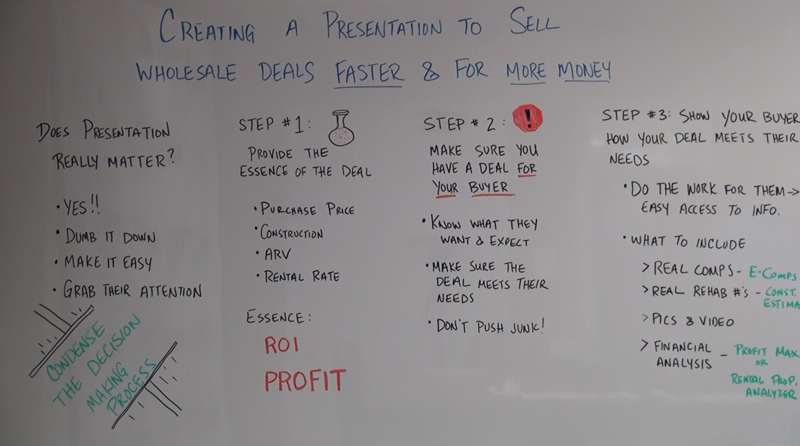 So, on the wholesaler’s end, does presentation matter? Yeah, absolutely. The goal with the presentation is to do a couple of things. Number 1, dumb it down, make it easy, and grab their attention. Basically, we want to condense their decision making process down into 1 or 2 numbers that they can easily glance at and say, “oh, this is a good deal,” or “oh, this isn’t for me.” Very quickly. You want to be able to present that really quickly. Let’s talk about how we are going to do that. Step 1 is to provide the essence of the deal. What am I talking about? The essence is the underlying principles, or the overview. They are the numbers. You want to present this in such a way that if you were sitting at your desk and you opened up the email, within half a second you could know whether this is something you want to learn more about, or not. How do we do that? What we’re going to present is the purchase price of the property, construction, after repair value, or rental rate, depending on the type of exit strategy that you’re proposing for the property. So you’re going to want to take a look at the rental rate if it’s a rental property, and the ARV is important if it’s a rental or resale, but it’s much more important if it’s a flip. The essence that I’m talking about – we’re going to provide these numbers – but we’re going to be focusing on the return on investment, or the profit. So if we’re doing a rehab, I’m going to present all of this information, but my title right at the top is going to be: $50K PROFIT. If it’s rental property, it’s going to be: 15% ROI. That’s your headline, that’s what’s going to jump out. You want something that’s going to grab the viewer’s attention. That’s the essence. And then from there, we give a little overview. Purchase price, contruction, ARV, rental rate, stuff like that. Boom: step number 1. Step number 2, and maybe this should be in step number 1, but step number 2 is going to be, make sure you have a deal for your buyer. First of all, it’s got to be a deal, second of all, it’s got to be a deal for your buyer. Different buyers want different things; just like you probably look for different investments yourself and what might not be good for you might be good for someone else. So, you need to know what they want and what they expect from an investment. If I’m a rental property investor, maybe I’m looking for a certain return on investment in a certain neighborhood. If somebody provides that to me I’m going to be more apt to buy, and buy a lot and buy quickly. So, you want to present these properties to the people who are looking for them. If you’ve got somebody who’s looking for flips, why would you send them an email for a deal in a rental neighborhood? It doesn’t make sense. You want to make sure the investment matches the expectations and the criteria of the buyers you’re targeting. Next, you want to make sure that the deal meets their needs. We just talked about that. Lastly, you want to make sure that you’re not pushing junk. I open up these emails from these wholesalers and – let me take a step back – I don’t know if you’ve ever had this experience, but you’ll be sitting there doing your work and your phone rings and you pick up and they’ll say, “do you guys buy houses?” And I know it’s a call from a new wholesaler, because a new guru came to town and pitched them building a new buyer’s list and this-that-and-the-other-thing and how building the buyer’s list is the most important part of wholesaling. The whole point of their conversation is to get my email, get me on a list so that then they can send out emails to properties that they get that usually they got from another wholesaler who they put $5000 on the deal and send it back out, and, you know. Before you know it, I’m on 50 different lists, I’m getting 5 different emails of the same property at 5 different prices and I’m ready to lose it. So, nobody wants that. Not you, not me, and it doesn’t do anybody any good. Make sure you’re not pushing junk, if you have a good deal, people will buy it from you. If you present it well, they’ll buy it for more money and more quickly. Step 2, make sure you have a deal from your buyer. And step 3, and this is where we’re going to spend a lot of our time with the training is, show your buyer how the deal meets their needs. When I create these flyers to send out – I’m talking electronic flyers – you can print out the flyers or whatever, I try to make my buyers’ lives easy. If they like my headline, if they like this essence of the deal, $50K PROFIT, I want to create backup material or backup references so they can easily go review the data that supports my claim for the $50K profit. So, what’s that mean? First we’re going to do the work for them. We’re going to give them easy access to the information. First, I pull comps on the property and I provide them with a list of the comparable sales. If I tell them the ARV of the property is $200K and there’s nothing to substantiate that number, it makes me look like a fool and it makes them not interested. However, if I can present comps where I say the property is worth $200k, and I can show that there’s 5 houses on the block in the neighborhood that sold in the last six months for between $200K and $220K, that makes me look great because I’m just as able to say it’s worth $220K. You want to make sure you’re giving real comps. I’m talking about same number of bedrooms and bathrooms, same neighborhoods, same types of properties, same square footage, generally. At 360 you have a great tool with the E-Comps tool where you can pull comps in any neighborhood all across the country. That’s one the supporting references that I use with my buyers. I’ll show them, “I say it’s worth $200K, here’s an E-Comps layout of the all of the properties I’ve sold recently within a general vicinity.” And they are able to look at the same numbers I’m looking at. Next, real rehab numbers. If you tell me a property is only going to cost $15K to do all of the repairs and you’re gutting the thing down to the studs and rebuilding it, I’m going to laugh in your face. I don’t care if it’s a 1-bedroom apartment, or if it’s a full house, $15K is not going to get it done. You want to be able to present to them an honest presentation of what this is going to take to get the work done. What’s that mean? That means knowing your construction figures. And if you’re not comfortable with them, that’s okay. But that’s why we provided the construction estimator in the Tool section of the site so you can go in and itemize room-by-room, item-by-item and you can give a realistic expectation of what the construction costs may be. It might cost them a little bit more to do the work, or it might cost a little less, but at the end of the day, they’re going to respect your estimate because you’re going to be able to provide them with an itemized breakdown. This is supporting material that is again just bolstering this claim of 15% ROI, $50K PROFIT, whatever your essence is, or your headline is when you’re putting out these deals. Next, pictures and video. This is a great technology and we’re in a great age technologically. It’s very simple, with a cell phone to take a ton of pictures throughout the house or to do a video walkthrough. I do a video walkthrough of every single property that I look at. I do it for 2 reasons: First reason is, I want to remember what I looked at. If I’m looking at a couple dozen properties on a monthly basis, somebody calls me from 2 months ago, I’m able to pull up the video of the walk-through that I did while I was at the property and comment on the specifics on the property. Likewise, once a property goes under contract, now I have an added nuance for my perspective buyer to take a look at. “Hey, you want to schedule an appointment? That’s great. Let’s look at the video.” If you don’t like what you see in the video, there’s no sense in scheduling to come out and see the property. So, I’m providing them with as much info as we can, even to the point where they can feel like they are walking through the house with me. And then lastly, I want to provide a financial analysis, how did I come up with the $50K profit? Yeah, these are the overviews and supporting numbers, but let’s make it detailed for them. If it’s a rental property, I want to be able to use the rental property analyzer so that I can show them the real expected expenses. “Yes, I took into consideration vacancy rate, management costs, ongoing maintenance, taxes, insurance, homeowners insurance, all of these expenses that are real expenses, and it’s still a great deal.” This is where I get my rental numbers, so I’m going to have supporting data there. The idea here is to present them with backups on your comps, backups on your construction numbers, backups on the condition of the property with video and pictures, and then finally, a financial overview of the entire project, where you can say, this is the construction that needs to be done, this is the purchase price, these are the real expenses, soft costs, and whatnot. If it’s a flip, use the profit maximizer. You’ll have a detailed breakdown of every part of the transaction, and now it’s a no-brainer. When you say $50K, how can they say they’re not going to make money? And at that point, they’re going to be a lot more apt to pull the trigger faster, and for more money. So, those are some key tips. Take them as they are, implement them and start making more money on your wholesale deals and making it faster. That’s it for today’s training. Until next time, best of luck in your real estate investing.